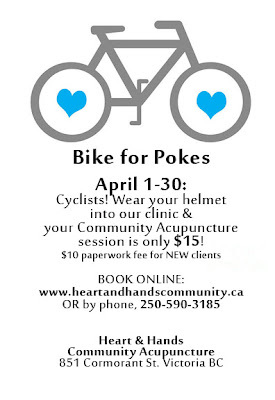 We are pleased to offer the Victoria cycling community a fantastic discount in April for a fantastic community-based service! Feel free to circulate this with Victoria-based groups, organizations and individuals who would benefit from this great opportunity to invest in personal health and wellness as well as supporting local community-based healthcare! From April 1st to 30th, when cyclists arrive to our clinic wearing a helmet, their Community Acupuncture session is only $15 (regularly $20-40 sliding scale). A $10 1st time paperwork fee applies to NEW clients. The Heart & Hands Health Collective is a grassroots social enterprise located at 851 Cormorant St. in the heart of North Park. The core service is Community Acupuncture, high quality sessions provided in a supportive group setting at sliding scale rates ($20-40/session). Serving a diverse client-base, this practice model decreases many of the socio-economic barriers in terms of isolation, accessibility and cost (going rate in Victoria being $60-120/session). Serving 50-100 clients weekly, the goal is to increase accessibility so individuals can receive care as much and as often as they need to get well and stay well.